Borehole paths (i.e. the linear track of a borehole in three-dimensional space) were imported via normal SKUA-GOCAD 2013.2 well location import filters. SOBI well identifiers were standardised to exclude back-slash, underscore or other separators. Each borehole was tagged with additional identification information (held in Well Constant fields within SKUA-GOCAD 2013.2) including the borehole name (spaces replaced by underscores), the BGS identification number and a tag to identify specific groups of uploaded well information. Wells were imported as simple vertical paths, several of the wells are known to be deviated and these paths will be amended as deviated path information becomes available. Table 2 Format for well path information. Facies data were imported via SKUA-GOCAD 2013.2 well property import filters. Note the necessity of a NULL entry (-99999) in the final line. Table 3 Example format for the upload of facies information. 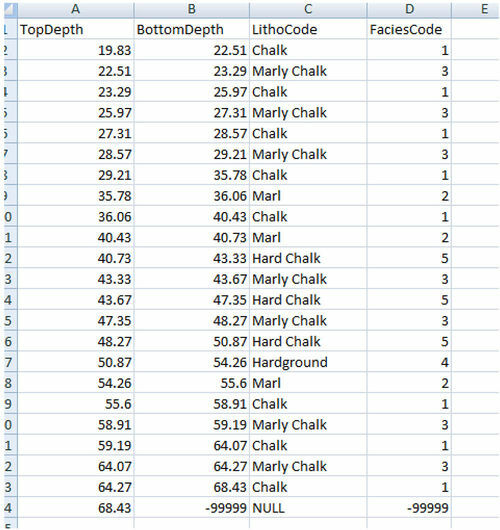 Downhole depths for formation tops and marker bed were imported using normal SKUA- GOCAD 2013.2 import filters. Geophysical log data were imported for a selection of wells as LAS files. During batch upload LAS files were matched to well paths using file names rather than standard LAS identifiers held within the file. This necessitated renaming of LAS files (Table 4). Unfortunately BGS Recall log database exports LAS files with SOBI identifiers with back-slash characters that are not permitted in SKUA-GOCAD 2013.2. Table 4 Naming convention for LAS files. 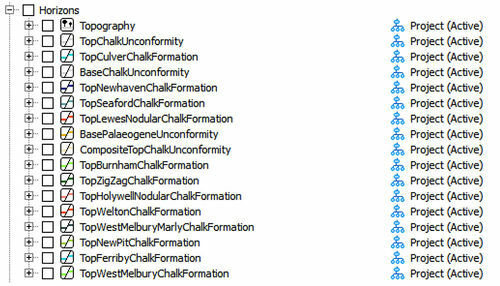 OS Terrain 50 was converted from ESRI grid format to Zmap format for import into SKUA- GOCAD 2013.2. DigMapGB-50 were imported as shapefiles and given an elevation attribution by fitting to OS Terrain 50. A variety of raster maps showing geological and topographical features were imported as images. Geological linework, well markers and other stratigraphic data were assigned to their corresponding Horizon feature class (Figure 6). Figure 6 List of Horizon feature classes used in the model. This page was last modified on 7 May 2015, at 13:11.